This is for TWO shirts, a white one and a black one, with your name and number in vinyl on the back. 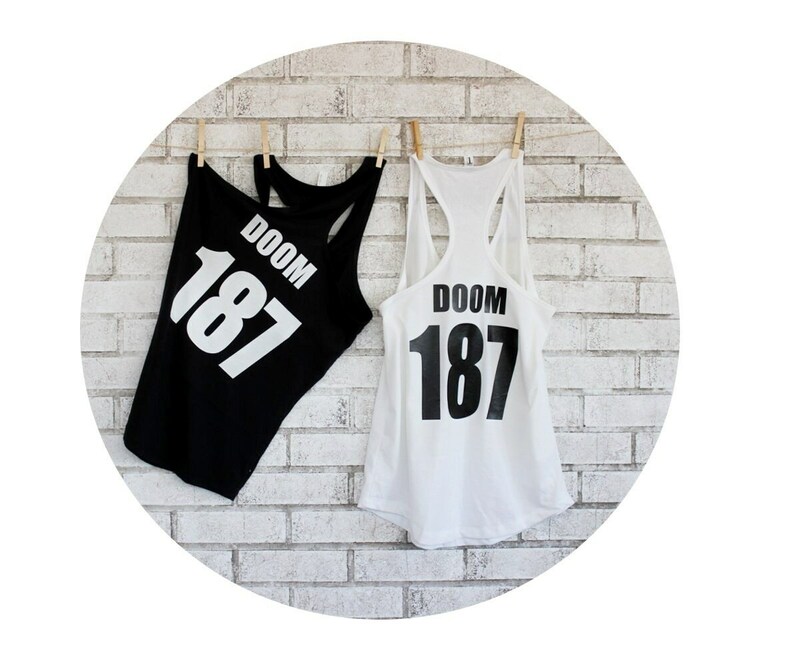 These are ladies fitted cotton tank tops. This has special set pricing. Numbers will be over 6" and name will be about 2" so they meet WFTDA requirements. The front of the shirts is blank. I can make shirts in other colors, or even with glitter vinyl! If you want I can put a graphic on the front. Contact me with pricing and other details about customization. -Please Write your name and number in the "message to seller" section during checkout. -because this item is custom, it is NOT eligible for a refund or exchange, please use the detailed instructions below to choose the correct size. Only you can choose the correct size by using the measuring instructions. •Tank tops are next level brand, depending on the color. Notes: Bust (width) is taken 1" below the armpit. Length is from the high point on the shoulder. Measurements are taken flat. Double for circumference. EVERY CLOTHING BRAND RUNS SLIGHTLY DIFFERENTLY SO IT IS ESSENTIAL TO UTILIZE MEASUREMENTS WHEN ORDERING CLOTHING ONLINE TO DETERMINE THE CORRECT SIZE. Measurements for this garment can be found in the item description above. Please contact me with questions- I am happy to help. The best way to get a good fit is to measure a garment that fits you well. Lay the garment down flat and measure the length and width- Double the width for the circumference or "chest measurement" . The size with the closest match in dimensions will be the best fit.